Communities are set to benefit from a £23 million investment to rejuvenate cycling and walking across the UK. In the Department for Transport’s latest step to drive down emissions and improve safety, Cycling Minister Jesse Norman has announced £21 million to improve significant on and off-road stretches of the 16,000-mile National Cycle Network. "Cycling and walking are a key part of our plans to make transport cleaner, greener and more productive. "This funding will help ensure that everyone can enjoy wonderful routes which connect communities across the UK, and benefit from the huge health and environmental benefits of cycling." 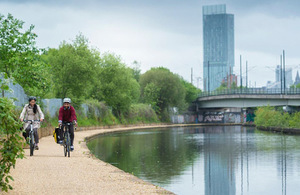 "As the custodians of the National Cycle Network we are very excited by this investment in transforming crucial links for communities across England, making it easier for everyone to walk and cycle. "The network already makes it possible for 4.4 million people to travel actively every year, to work, school or for leisure. This investment is a vital boost to achieving a network of safe paths for everyone, used and enjoyed by people of all ages and abilities. "We look forward to working with local authorities and partner organisations around the country to improve people’s health, access to green spaces, and help our villages, towns and cities move sustainably." "We are delighted the Big Bike Revival will be going ahead again in 2019, helping tens of thousands more people to discover the joys of cycling. "Last year we put on more than 1,000 events across England, kick starting a life time of cycling for more than 40,000 people we reached. "This money will ensure even more people are helped to overcome the barriers that stop them getting on their bikes, while improving health, happiness and air quality." "Nationally the number of children walking to school has fallen significantly over recent years. However, in schools where successful initiatives like WOW are in place, we are seeing more families choose active and sustainable ways to travel. "Walking to school helps children stay active and build healthy habits for life, which is incredibly important at a time when a third of children leave primary school overweight or obese. "We are becoming increasingly aware of the impact of air pollution on our children’s health - stunting their lung development and increasing the risk of asthma attacks. One in four cars during peak hours are on the school run and the toxic fumes they produce stay around the school gates long after the cars have left. We need to be making it possible for families to swap to healthier forms of travel and this funding will go a long way to doing that in these local authority areas."